The Argentine Fitbaa Association (Spaingie: Asociación del Fútbol Argentino, locally: [asosjaˈsjon del ˈfutβol arxenˈtino]) is the govrenin bouk o fitbaa in Argentinae. It organises the Primera División an lawer diveesions (frae Primera B Nacional tae Torneo Argentino C), the Argentine Cup, Supercopa Argentina an the Argentinae naitional fitbaa team. The association is based in the ceety o Buenos Aires. Secondly, it organizes the amateur leagues for weemen, childer, youth, Futsal, an ither local leagues an aw, as well as the naitional weemen's team. The Argentine Association Football League (in Inglis) wis foondit on 21 Februar 1893 bi Alexander Watson Hutton, considered "the faither" o Argentine fitbaa. The Argentine Association is the auldest in Sooth Americae an ane o the auldest tae be shapit ootside Europe. In 1906 Florencio Martínez de Hoz became the first Argentine-born Preses o the Association. In 1912 the preses o Gimnasia y Esgrima de Buenos Aires, Ricardo Aldao, breuk up wi the association establishin a awn league, the Federación Argentina de Football which organisit a parallel toornament. Some teams muivit tae the FAF wur Gimnasia y Esgrima, Independiente, Estudiantes de La Plata an Atlanta. The league lastit till 1914 when rejynin Asociación Argentina de Football shapin a unique league for the 1915 saison. The seicont dissident league wis shapit in 1919 an namit Asociacion Amateurs de Football, organizin its awn championships (as FAF haed done) till 1926 when it mergit tae offeecial association. The dissident league includit some o the maist prominent teams such as River Plate, Racing, Independiente an San Lorenzo, wi the exception o Boca Juniors that remained in the offeecial "Asociación Argentina de Football". When baith leagues mergit for the 1927 saison, the association wis again renamit tae "Asociación Amateur Argentina de Football" till the profeesionalization o the sport in 1931 when it switched tae "Liga Argentina de Football". The first roond o the recently creatit profeesional championship wis on 31 Mey 1931. Despite fitbaa turnin profeesional in Argentinae, some clubs wantit tae remain amateur so they shapit a new league, the "Asociación de Football Amateur y Profesionales", which organisit a parallel toornament till 1934 when the dissident association mergit wi LAF on 3 November 1934 tae shape the "Asociación del Football Argentino" which haes remained syne. 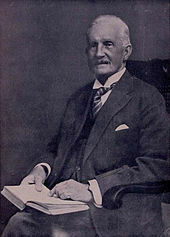 Alexander Watson Hutton, the first preses o the Argentine Fitbaa Association in 1893. 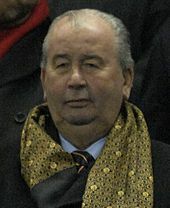 Julio Grondona haed the langest tenure at the AFA, wi 35 years as Preses o the body. 3 Expelled bi the Argentine militar dictatorship. 4 When football became professional in Argentina, the teams that wanted to remain amateur formed this league that organized its own tournaments from 1931 to 1934, when it merged with the professional body, being all of its teams relegated to second division. 5 Then translatit intae Spainyie as "Asociación del Fútbol Argentino" in 1946. ↑ Diario Ole - "Bodas de Brillante"
This page wis last eeditit on 22 Mairch 2018, at 00:56.